TTDILA: Great, Scott! 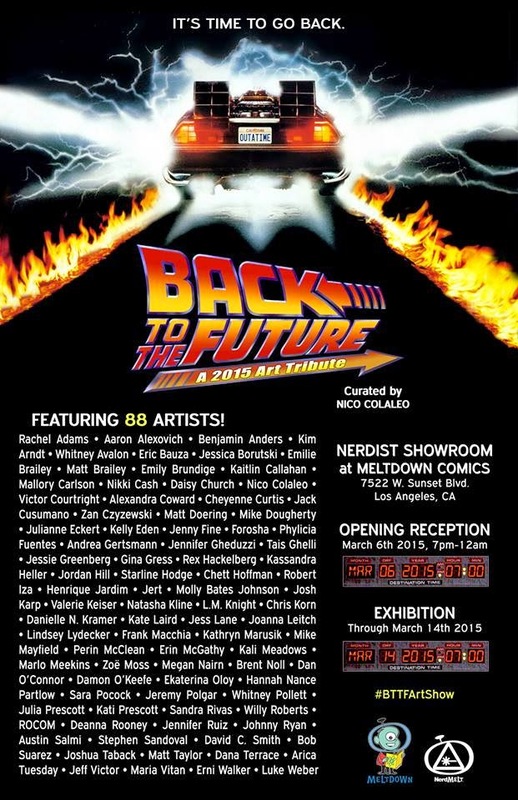 Tell me, why should the good people of LA go out to this art show for Back to the Future? Can we punch Robert Zemeckis in the head until he goes back to normal and stops trying to make CGI movies profitable? Zemeckis?!!! Nico Colaleo: This show is gonna be completely rad. 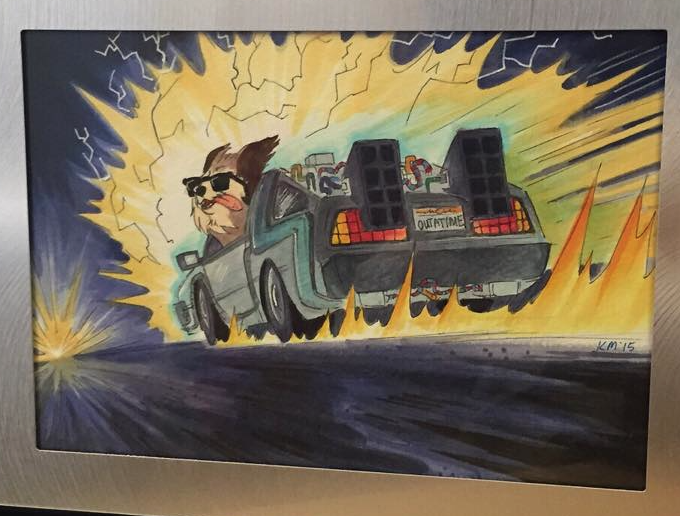 If you're a fan of Back to the Future (and who isn't?) you're most likely going to wanna attend! Why are you having the show? Is a new special Blu-ray coming out? It's 2015, the year Marty and Doc travel to the future in Part II! Also the movie's 30th anniversary. So I figured this would be a fantastic opportunity to hold this tribute. As a fan, what drew you to the film series? 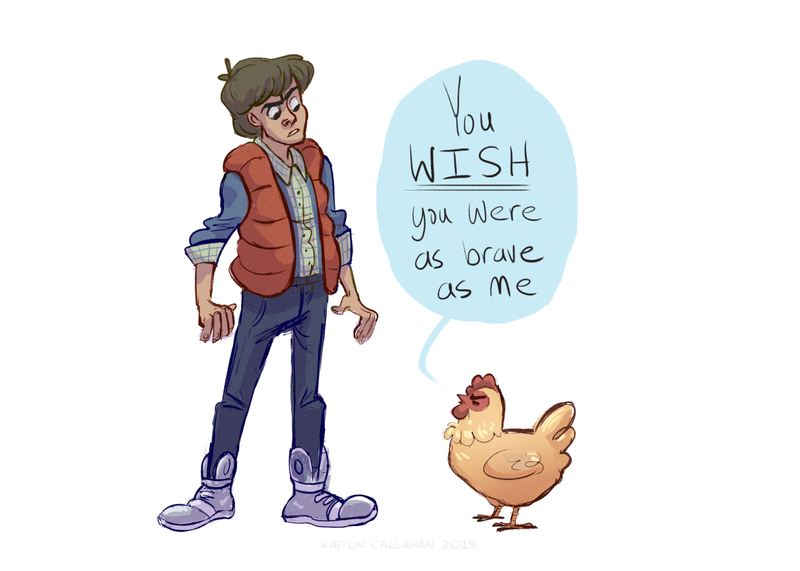 I've been a fan of BTTF since the movies came out, and I've watched them all my life. I was old enough to see Part III in theaters, too. And I think the team of Bob Gale, Zemeckis, Spielberg, the composer Alan Silvestri, and the whole cast during this period in the 80's were all in top form for this series, they just didn't really realize it at the time. Of course it's a movie about time traveling and sci-fi fun and action, but at its' core it is so masterfully written, with some of the strongest characters in film. I've just always loved these movies. If you could own anything from the films what would it be? Oh man, ummm. Probably one of the DeLorean cars from the production? That'd be so amazing to own and just drive around and hang out with, haha. Who are some of the artist your looking forward to seeing the most? All of them! The beauty about my shows is that most if not all the participants are good friends of mine that I know at work or in everyday life, so it's more like throwing a party with your pals than it is a formal gallery with little personal connection. I'm excited for every single thing that everyone plans to submit! 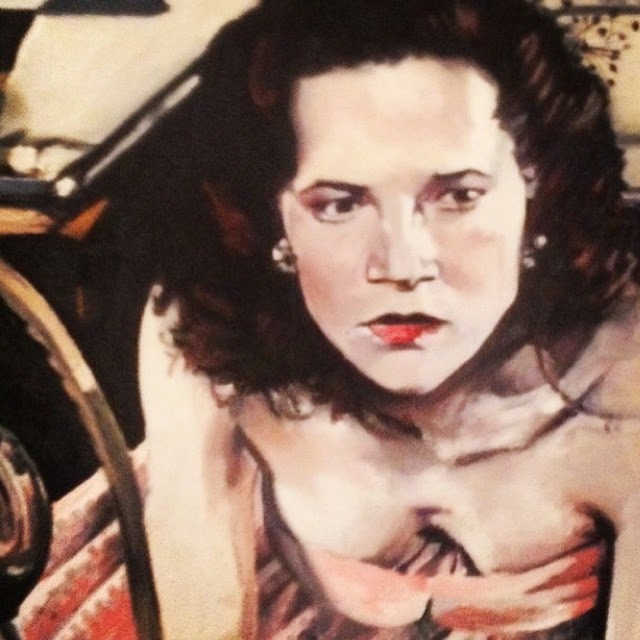 Other than the art, what's going to be at the show? 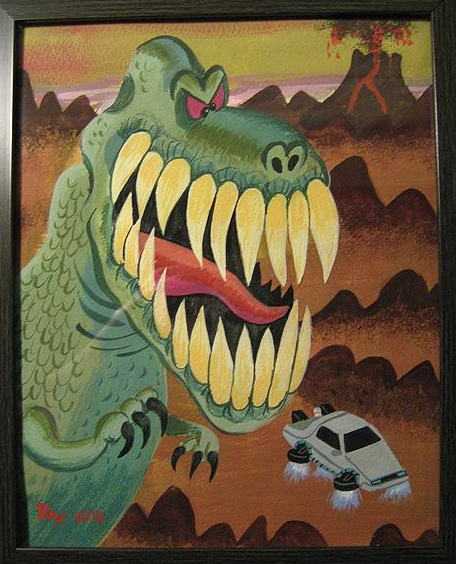 Themed decor, a bar with free beer and wine, and very special- One of the DeLoreans from Part II will be parked outside the front of Meltdown Comics, perfect for a photo opportunity for guests. Most of it is organizing the roster of artists. Scheduling with each artist and making sure if they have the time to participate in the show or not. Making sure that all artwork is turned in on time with the proper information needed to display their names, piece and pricing information. Hanging all of the artwork, of course. Gathering and building any of the supplies needed to create fun photo booths/opportunities. Securing live music, musicians or DJs, food trucks, anything that needs to be scheduled way ahead of time. It's basically getting lots and lots of people to all commit and bring themselves together toward something that's only happening once and at a certain day/time... which in actuality takes a lot of time and effort to do. But when the show is all said and done, and the opening gallery is happening and you're seeing everyone showing up and having such a good time; That's when it's all worth it! I believe your also an animator, is this something you do on the side for fun? Yes, curating art gallery shows is just a hobby of mine. I participate in lots of friends' other art galleries too, whether it be also at Meltdown, or at Titmouse Animation Studios, Nickelodeon Studios, Gallery Nucleus, and also nation-wide galleries outside of Los Angeles. For my actual day job, I'm currently an animatic editor at Nickelodeon Studios, on an upcoming series called Pig Goat Banana Cricket. It's created by the amazing comic artists Dave Cooper and Johnny Ryan, and should be premiering sometime in Fall/Winter of this year. It's an artistically beautiful and totally crazy show, I have a feeling it's gonna be a hit! 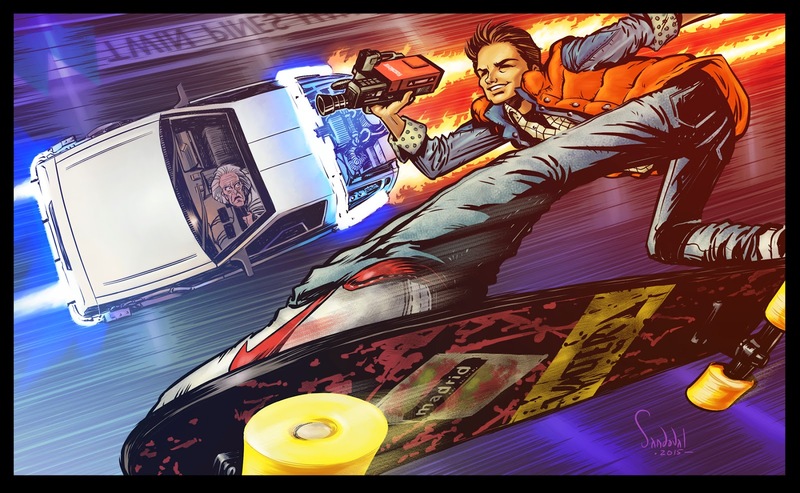 Who will you be dressed as Doc or Marty? Haha nope, I'm a tall guy at 6'4 with wide shoulders/build, so it's kinda hard for me to cosplay sometimes. I'll just be dressed as myself. BTTF cosplay from guests is certainly encouraged though! Honestly, will Biff be there. Isn't he local and a comedian who performs sometimes at Meltdown? I would love for Thomas Wilson or any of the cast to attend! Actually Tom is the voice actor for Banana on the Pig Goat Banana Cricket show, and while I've put feelers out there to get him aware of it, I also don't want to approach him here at the studio and come off as pushy in our work environment. We'll see! Will Rick and Morty pieces be the norm as they basically wouldn't exist without the movies? Actually, three pals of mine from Rick and Morty ARE in this show! Dan O'Connor, Jack Cusumano and Brent Noll. So there's gonna be some good R&M representation.